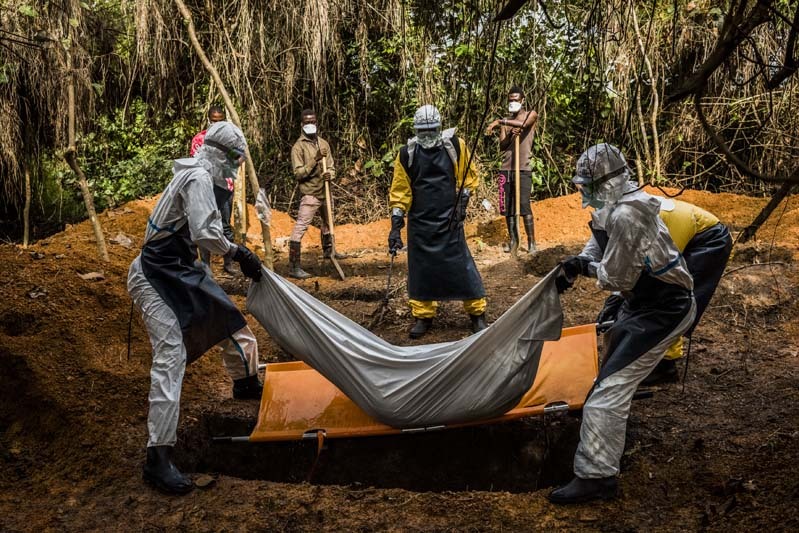 SUAKOKO, LIBERIA - OCTOBER 05: A burial team transfer Mama Flomo,37, mother of three, into her resting place in a graveyard adjacent to the Bong County Ebola Treatment Unit on October 5, 2014 in Suakoko near Gbarnga in Bong County, Liberia. Mama Flomo,who wasn't able to be tested for Ebola as she passed away before she reached the Ebola treatment centre. She passed away while giving birth to her third child prematurely. The daughter was born 1 month prematurely. Mama Flomo's boyfriend has tested positive to Ebola and had survived the virus having received treatment at the MSF Ebola treatment center in Monrovia. Medical staff are unsure of the child's exposure to Ebola whether it was transferred trans-placentally or whether the child would be infected by Ebola during the birth process. It was unclear of Mama Flomo's Ebola cotamination, however she was turned away from two hospitals as she was showing symptoms of Ebola.